I’m sure most people reading this will know about the BBC programme Dragons’ Den. In terms of viewers, it attracts business entrepreneurs and amateur enthusiasts alike. Theo Paphitis is perhaps best known for being a former Dragon, but he is also a champion of small businesses. 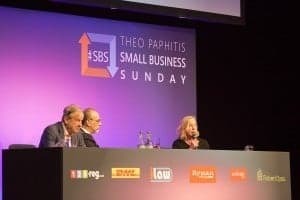 Small Business Sunday (#SBS) is his initiative – you can tweet Theo about your business on a Sunday evening using the #SBS tag. If he likes what you have to say he retweets you to his followers. That’s how you become a winner. Knowing how to relax using mindfulness and meditation. Knowing how to be mindful of what is going on in their mind and body. Then being able to respond to that knowledge in a way that nurtured long-term health and feeling good. That’s when the idea for Wisdom-Mind was hatched. This was going to be the way I would be able to teach mindfulness and meditation in a way that was practical and applicable to everyday life. I was keen to gain new followers and interest. So the idea came about to put in an entry for Small Business Sunday. I put together a 30-second video explaining how acupuncture helps with pain… and it caught Theo’s eye! 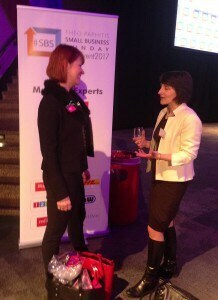 And so I joined a select band of #SBS winners!!! There were no further dramas, and we arrived safely. The ICC is in the centre of Birmingham, right on the canal network, so a lovely setting. If it hadn’t been February, I would have enjoyed sitting outside at one of the cafés. But anyway, there was plenty going on inside. The first few hours of the Winners’ Conference was informal networking followed by a talk by ‘Gummee Mummee’ Jodine Boothby, a previous #SBS winner. Jodine’s talk was emotional and inspirational. From someone who left school with no qualifications she now has a £million turnover international business. She started out with a great idea for a baby’s teething glove, but having an idea isn’t enough on its own. Jodine struggled and struggled to finance and develop her first teething glove and then get it out into the shops. She worked at her local newsagent and had persuaded her boss to let her put up a poster explaining wat she was trying to do. And that she needed help with raising the money to do it. She finally hit gold with a local man who turned out to be one of the Guilford Four. He had been wrongly accused and imprisoned for being involved in an IRA bombing campaign. He became her business angel, funding her business with some of his compensation money. 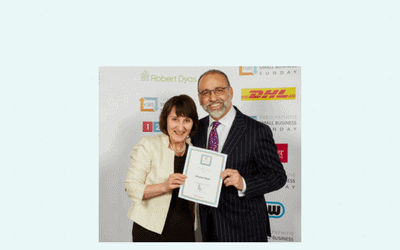 One of the best parts of hearing this story was seeing ‘an ordinary person like me’ growing a successful company that has helped out loads of babies with teething all over the world. Even better was knowing that much of their growth so far had been achieved by working from home. Even though they were now a big business! Finally, the moment we’d all been waiting for – Theo was on stage! What a buzz! He gave a talk about his thoughts on Brexit and how it would affect businesses. Using excerpts from various TV programmes he had been interviewed and in his own laconic style. He explained he was originally leaning towards Remain but became a Leave as he concluded that the EU is a failed experiment. He was strongly of the opinion that no one knows what the future holds with Brexit or how leaving will pan out. But he believed that there will still be plenty of opportunities for businesses to be successful. ‘to worry is a positive thing – embrace it as a positive way of thinking’. The panel fielded lots of questions about how to be successful in marketing and getting your business better known. One lady asked about how to be a successful woman entrepreneur. Deborah said there was no need to differentiate between men and women entrepreneurs. They are both facing the same challenges. After that, the highlight of the day… getting my photo taken with Theo! He asked me who I was and about my business, and gave a great smile for the camera. How he did that for the 300 winners who were also there I will never know! But I’m sure they all felt as I did – pure pride at their achievement. 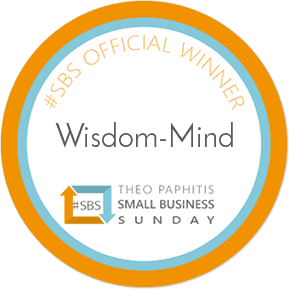 For all of us who have been #SBS winners, having our own efforts acknowledged by someone of his stature is a golden boost to our confidence and business credibility. And that’s priceless. Thank you Sally. It was a really fun day.